Magneto resistors have a variable resistance which is dependent on the magnetic field strength. A Magneto resistor can be used to measure magnetic field presence, strength and direction. They are also known as magnetic dependent resistors (MDR). A magneto resistor is a subfamily of magnetic field sensors or magnetometers. A magneto resistor is a resistor of which the electrical resistance changes when an external magnetic field is applied. 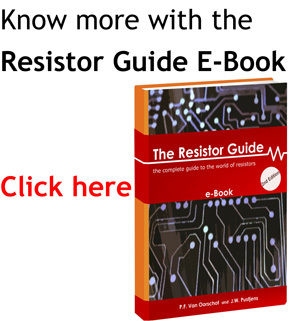 Magneto resistors make use of the magnetoresistance effect. This effect was first discovered in 1856 by William Thomson, also known as Lord Kelvin. The effect is noticed in ferromagnetic materials and dependent on the magnetic field strength and angle between the direction of electric current and the magnetic field. This effect is therefore known as anisotropic magnetoresistance (AMR). Other, more recently discovered magnetoresistance effects are the giant magnetoresistance effect (GMR), collosal magnetoresistance effect (CMR) and tunnel magnetoresistance effect (TMR). Because most conventional magneto resistors utilize the AMR effect, the other effects will not be discussed in this article. Permalloy, an alloy consisting of 81% nickel (Ni) and 19% iron (Fe) has a high anisotropic magneto resistance as well as a low magnetostriction (change in size due to magnetic fields) and therefore is a favorite material for magneto resistors. Magneto resistors are often constructed of long thin films of permalloy. To increase the sensitivity of a permalloy magneto resistor, shorting bars of aluminium or gold are placed on the thin permallow films under an angle of 45 degrees. This forces the current to flow in a direction of 45 degrees relative to the length of the film. This is called a barber pole configuration. a typical AMR magnetoresistive sensor is constructed of a combination of 4 permalloy thin film magnetoresistors, connected in a wheatstone measurement bridge. The following symbol is used for a magneto resistor. It is shown as a variable resistor which is dependent on magnetic flux, indicated by ‘x’.